An arborist, otherwise known as a tree surgeon, is a person trained to maintain trees in top condition, with an in-depth knowledge in horticulture including plant and soil biology, identification of tree species and disease control. 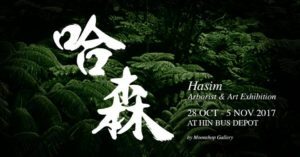 This new exhibition, Hasim: Arborist and Art, at contemporary arts centre Hin Bus Depot is to celebrate arborists’ work in general, but specifically to remember the work Hasim, a local arborist who successfully transplanted two raintrees to Hin Bus Depot earlier this year, and then unfortunately passed away a few weeks later. 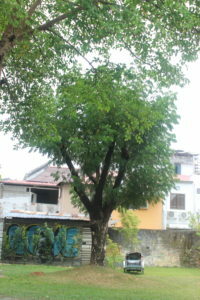 The trees were two of seventeen that were transplanted around Penang after being threatened by a road expansion project. The exhibition includes botany art installations, educational talks and workshops that are open to the public.The Hin Bus Depot gallery will be filled with botany art installations such as a giant terrarium, an ornamental tropical living wall, Alice in the Wonderland-themed table settings and more. Visitors may enjoy these installations without admission fees. 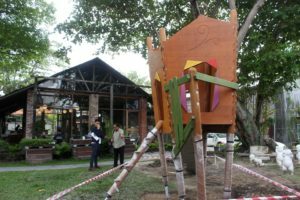 The Hasim Playground, a treehouse shaped children’s slide sponsored by Prima Sport & Play Sdn. Bhd. 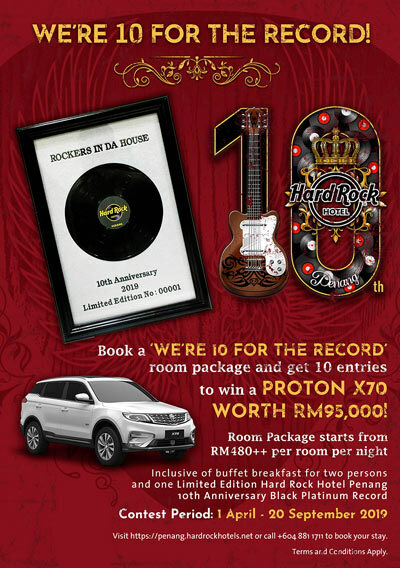 will be launched during the opening event. There will be several educational talks by local and overseas professional arborists, for example Mr Sammy Au, the only registered Consulting Arborist in Asia will open the exhibition with a talk on The Introduction of Modern Arboriculture. Other talks by local professional arborists will cover tree pruning, the profession of the arborist, and tree identification. A Tree Climbing Workshop will be conducted by The Habitat, an ecotourism venue located on Penang Hill. 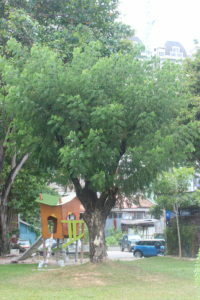 Participants will be taught how to climb trees using the raintrees in Hin Bus Depot. It will be held on Saturday 28th October at 4pm and again on Sunday 5th November at 3pm, is free of charge. 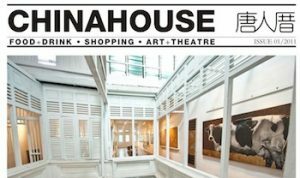 A Forest in a Bottle Workshop will be conducted by Moonshop Gallery, a plant design laboratory specialized in tropical ornamental plants. 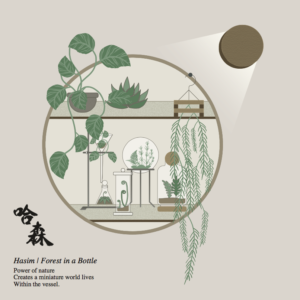 Its aim is to raise awareness of forest aesthetics and the rainforest ecosystem by helping participants to create a miniature rainforest in a bottle. This workshop is limited to 30 persons, will be held on Saturday November 4th at 2.30pm, and costs RM135 per person. The Moon Forest Workshop, also conducted by Moonshop Gallery, will guide participants to build a lit-up terrarium to resemble a little glowing rainforest, to teach participants about forest aesthetics and science. This workshop is limited to 20 persons, will be held on Saturday November 4th at 1.30pm, and costs RM500 per person. Pre-registration is required for all workshops. Email team@hinbusdepot.com to reserve a place. The 9-day exhibition will run from October 28th until November 5th. Hin Bus Depot’s opening hours are Monday to Thursday 12pm-8pm, and Saturday & Sunday 11am-8pm.